November is a golden month with the birthstone of yellow topaz and the birth flower Chrysanthemum. 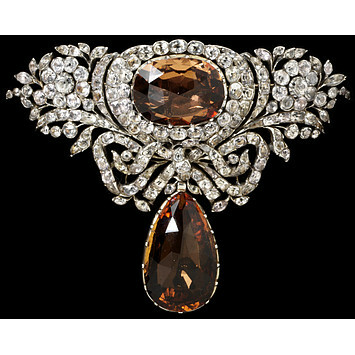 During the Middle Ages the topaz was thought to be a talisman that could heal illnesses of both the mind and body while postponing death. One of the largest known deposits of the gemstone is located in Minas Gerais, Brazil. 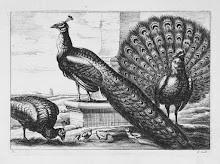 The stone was incorporated into Portuguese jewelry of the eighteenth century like the intricate bodice ornament. Sprays of flowers composed of rock crystal set in silver flank an oval sherry topaz that terminates in a bow with a large pear drop. Alphonse Mucha, the Czech Art Nouveau painter and decorative artist depicted the gemstone as a beautiful tawny woman. Chrysanthemum is from the Greek meaning gold flower. Because it is a perennial it is a symbol of returning wisdom. 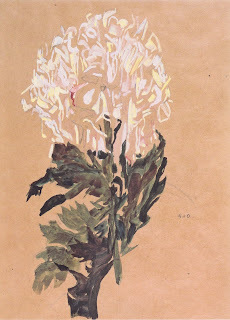 Austrian painter Egon Schiele (1890-1918) painted a white Chrysanthemum, signifying truth. Photo of bodice ornament from Victoria & Albert collections.